What does a social enterprise aim to do? The above description of what characterizes a social entrepreneur and social enterprise mentions the creation of social value and the change of existing paradigms in a more positive manner, but what constitutes positive is not well defined and will change depending on whichever political, national or personal ideas any given organization or entrepreneur believes in. A red thread shared by these goals and many social enterprises could be summed up as the prevention of current or future suffering and the promotion of human wellbeing. A visual overview of how this can be done is using Maslow’s Hierarchy (or Pyramid) of Needs11, see FIG. 2. While the initial theory proposed in 1953 has been developed upon further, it presents an intuitively easy representation of the problems which social enterprises can engage to increase human wellbeing. The pyramid has five layers, each representing a level of human needs, each layer difficult to reach if you have not achieved the levels below it. They move from the basics of survival (food, shelter, safety) to the realization of one’s self (getting respect, accomplishing goals, achieving happiness in short). In order starting from the bottom the five layers of needs are (1) physiological, (2) safety, (3) love and belonging, (4) esteem and (5) self-actualization. In addition to a quick explanation of each there will be an example of a social enterprise which deals with the challenges associated with that level, each taken from David Bornstein’s book How to change the World. (1) Physiological: The absolute basic human needs: food, clean water and air and shelter. These are the most important as without them survival becomes difficult or impossible. (2) Safety: These include protection against the elements, violence (both large-scale such as war and personal such as domestic abuse), disease and poverty. Often a basic semi-societal structure is needed to provide jobs, medical attention and peace. (3) Love and belonging: At the third level the needs rise beyond the purely physical and concepts such as family, friendship, love and intimacy becomes prevalent. (4) Esteem: Includes recognition, valuation, acceptance and respect, both for one-self and from others. (5) Self-actualization: The ability to take charge of one’s own life and set personal goals. Without the previous four levels a person may lack the physical and psychological resources to do so. 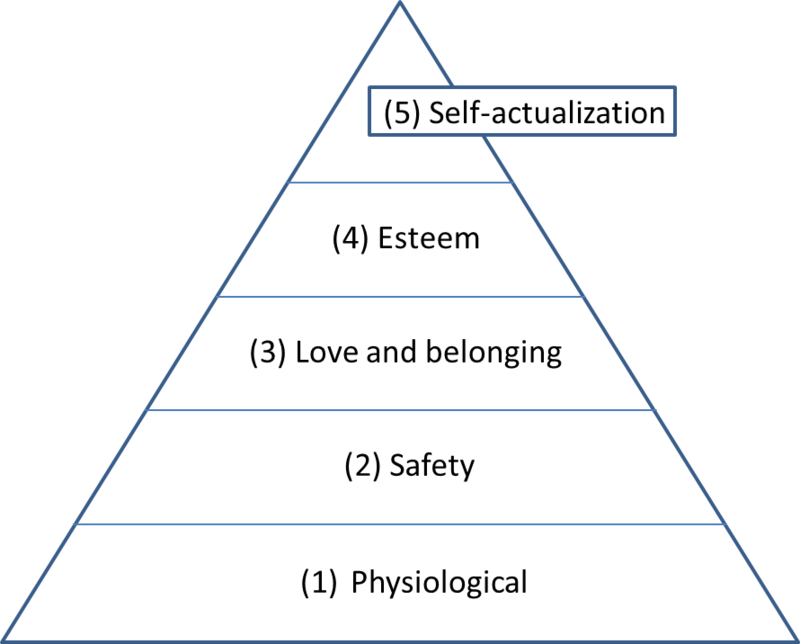 It should be noted that the idea of self-actualization is often either individual and can be shaped by the values one’s upbringing and those of the surrounding society such as the pursuit of fame, wealth, power or happiness; or ideals shared with or within a community such as national, cultural or humanitarian goals. It should of course be noted that generally any business approach would exist in the hierarchy as any business must provide value to its users and value generally exists because they solve a need, be it a supermarket which sells food and therefore solves physiological needs or the fashion industry which has convinced its consumers that their products will help them achieve respect or happiness therefore being a category 4 or 5. This difference in value types will be explored further in chapter four. Though Maslow didn’t use the pyramid structure himself, it is a fitting shape as more people in the world suffer from the problems in the lower layers and progressively fewer have reached the top. Another common metaphor, for example used by the Occupy Wall Street Movement and their 99% slogan17, is that the happiness and financial security of the upper layers are built and rests on the suffering and exploitation of the lower layers. While that is a debate for another essay it is often recognized that the higher you are on the pyramid the greater your chance of being a happy, fulfilled human being. In extension any project which helps people move upwards can be categorized as a positive one. In her book Corporate Social Entrepreneurship: Integrity Within18, Christine A. Hemingway covers the relation between Maslow and Social Entrepreneurs more in depth and notes that the development of self and others often is a key part of either the enterprise or the entrepreneur herself. Indeed if there exists a shared goal of the Social Entrepreneur community it could be to raise as many people as far up the pyramid as possible.